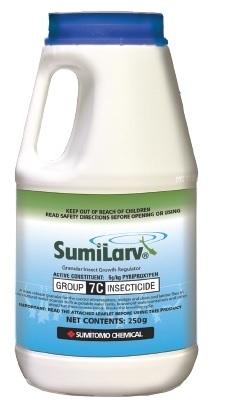 Sumilarv® Granular is the simple way to provide a long lasting reduction in mosquito populations. Simply drop one or more sachets into each potential mosquito breeding site and the controlled release granules gradually dissolve, releasing the insect growth regulator pyriproxyfen into the water. Later instar larvae die during moulting, breaking the breeding cycle and reducing the mosquito population.